here. Lee has been in and out of a few roles and departments over the years, but one thing has always remained the same: Lee stays true to his beliefs that learning can and should be fun. His presentations are always fun, interactive, and very informative. 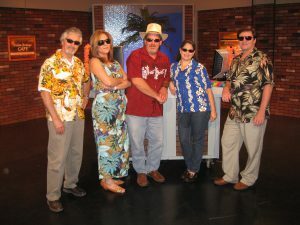 Back in 2010 or so, Lee and I shared cohosting duties on PalmBreezeCAFE. A local TV show that focused on gadgets and innovative new ways to integrate technology into the curriculum. Lee is always up on the latest trends in technology and loves to share his knowledge. ​ At Sloan-C during a post-conference training I had a participant that was late for his plane hover at the door for 15 minutes because he didn’t want to miss upcoming topics. ​As an Adobe Education Leader, I fit into a unique area of creativity that typically isn’t associated with Adobe or creativity. My speciality is online, distance and adult learning. Recently, I began a program in PD that has brought more dynamic learning to professional development. Those skills play an important role in training our teachers in the new SIS [Student Information System] attendance, gradebook, and management processes. It will be important in upcoming trainings I will design for a district-wide technology implementation.